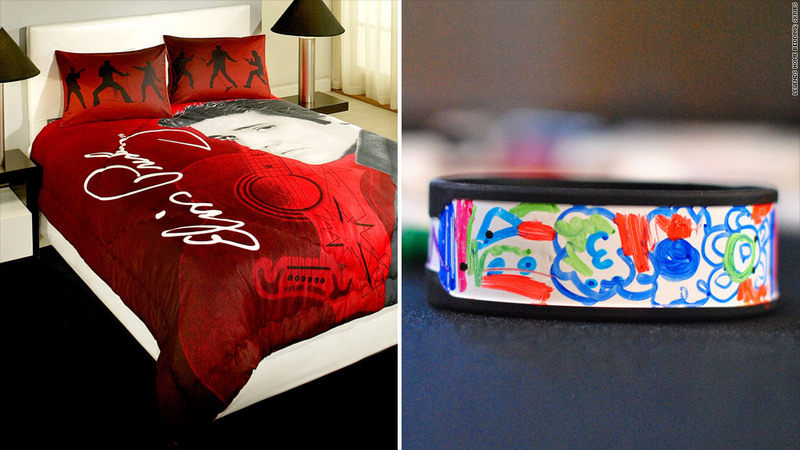 An Elvis Presley bedding collection and a set of customizable wristband won Wal-Mart's new product contest. Elvis will soon be in Wal-Mart's house -- and probably on its customers' beds. A bedding collection with The King was one of two winners of Wal-Mart's "Get on the Shelf" contest, which searched for the hottest new products in America. A line of customizable silicone wristbands was the other. The winning products will be sold on Walmart.com and likely in Wal-Mart (WMT) stores as well. "Winning the contest is like taking the elevator instead of the stairs," said David Bursteen, co-owner of Legends Home Bedding, the company behind the Elvis collection. Bursteen and his partner Ines Brigman approached Elvis Presley Enterprises last year with an idea and not much else. In an odd twist of fate, Bursteen scored a hard-to-get license even though he didn't even have a company at the time. Brigman, an aspiring designer, created two collections using archived photos of Elvis. "The idea was to create [lines of] bedding pretty enough to hang on a wall," she said. "We can potentially expand to other legends like Audrey Hepburn and James Dean." Bursteen said he had just received his first shipment of the bedding sets, which sell for $99.95, when he learned he'd won. "Our win illustrates how loved Elvis still is by people in America and all over the world," he said. Olugbenga Oredein, founder of SKRIBS wristbands, was in the gym when he got Wal-Mart's call. "I almost fell off the elliptical," said Oredein, who is pursuing a graduate degree in product innovation. Oredein's wristbands, which will cost $8.95 for a pack of three, have a dry erase strip along the center that wearers can customize with their own designs or messages. Oredein said winning the Wal-Mart contest is remarkable given that he hasn't even received the first shipment of wristbands yet. He expects to have them by January. Scoring a deal with the world's largest retailer is like hitting the jackpot for small businesses. The "Get on the Shelf" contest fast-tracks an otherwise lengthy and competitive process for companies vying for a vendor deal with Wal-Mart. Typically, companies have to pitch their products in person at Wal-Mart's headquarters in Bentonville, Ark. Wal-Mart said thousands of inventors, entrepreneurs and small businesses participated in this year's challenge. They sent in video submissions of inventions, ranging from interactive pajamas to a GPS tracker for your pets. The top 20 finalists -- chosen through an online vote -- pitched their products in person to Wal-Mart's merchandising team. Five winners were selected, and their products were made available for purchase on Walmart.com. The two products with the most pre-orders were selected as the grand prize winners. This is the second year of Wal-Mart's crowdsourcing contest. Last year, HumanKindWater beat out 5,000 applicants. The Philadelphia-based bottled water company received a one-year deal to be sold in 200 Wal-Mart stores and on Walmart.com. The company said 100% of the net profits go toward setting up clean water wells, water filtration and rain catchment systems in Haiti, Africa and Asia. Before it won, HumanKindWater didn't have any projects underway. A year later, it has 30 wells and filtration systems in four countries, said President T.J. Foltz. Foltz declined to say how much money the company has made from the Wal-Mart deal, but said the retailer will continue to sell the water for another year.